Please inform us once you have made the payment to avoid any delay in delivery. Having problems ordering online? The system does not accept your order and/or cannot add items to the cart? Please try creating a new account. You will receive a message within 24hrs from our staff once your order is ready for shipment. Please contact us at 09178246254 if you fail to receive the Txt message. You have 5 days to pay after placing your order. If you are unable to make payments your order will be cancelled. NO International shipping. We only ship items to the Philippines. 1. Browse our catalog, click the "Add to Cart" button. 2. Click on “My Cart” button located on the top right section of the page. You can also remove items and update quantities. 3. Click on "Proceed to Checkout" once you have finished adding items to your cart. 4. If you are an existing customer please enter your username and password. If you are a new customer select “Not Registered” button and sign up for new account. 5. Submit your order by clicking the "Finish" button (if you fail to do this step, we will not receive your order). 6. Summary of your order will appear on the screen and an order confirmation including payment options will be emailed to your email address. 7. You will get a message within 24hrs from our staff once your order is ready for shipment. If you don't receive any txt message in 24hrs, please let us know. 8. After you made your payment, kindly txt or call our Cabanatuan Number (09178246254) to inform us. We accept payments through BPI (free of charge), G-Cash (Account # 09178246254, with Php20 service charge for every Php1,000 and below cash in transaction), LandBank (with Php50 service charge) and PayPal. We are encouraging our customers to pay through BPI to avoid bank fees. All items are delivered nationwide via LBC. After we receive your payment, your order will be shipped the next business day via LBC (24 hour delivery). You can also pick up your order at #680 9th St. Kapitan Pepe Subd., Cabanatuan City, Nueva Ecija. Please take note that we are an online store and the above address is not a store. (due to time difference, replies may be delayed as we are managing this site from the U.S.). Add grazyahh@yahoo.com in your yahoo messenger. Contact number in Cabanatuan 09178246254. Pinoy DIY, Do It Yourself Guitar Effects building, Philippines premiere DIY store, Filipino one stop shop for building custom guitar stompboxes. 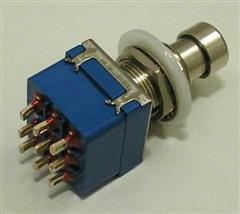 guitar switches, knobs, capacitors, transistors, boss fx parts, rotary switches, inductors, etc. Eliminate Tone Sucking with this rugged 3PDT switch. Ideal for heavy usage, in your wah pedals or for your true bypass loopbox.